Thimpress is an Elite author team on ThemeKeeper, we built themes for businesses and organizations with all of our efforts. Amazing menu and recipe list: The menu of this beautiful restaurant WordPress theme is operated under the Restaurant Menu Manager plugin by Noumaan Yaqoob which allows you to display image, price & description for each dish. Just clicking the “Drag here” button, then a real lovely book shows. User friendly and SEO friendly UI/UX: The design of NEM is so impressive and amazing that you will never find in other restaurant WordPress templates. The menu and OpenTable booking form is arranged horizontally along the sidebar. One clicking into menu, you will see as a book showed. An HTML 5 video is embedded into the Slider Revolution to make your restaurant website so lively. One click install with demo content: We have built a Demo content Importer inside the Theme Options. 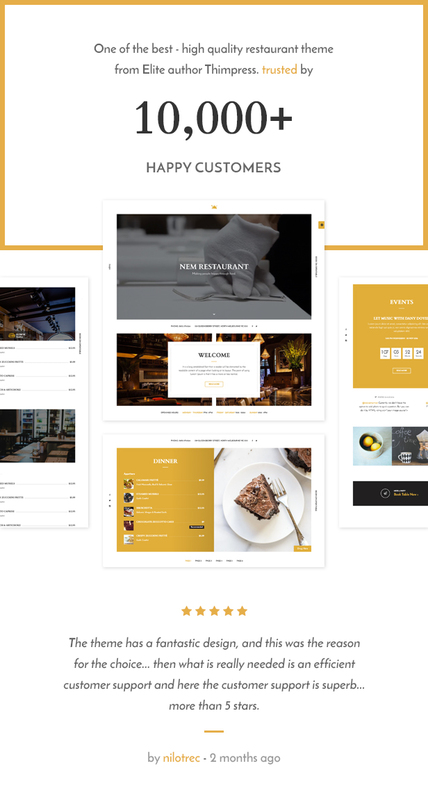 Simply click the button and you will get your restaurant’s website up and running in no time with all the prebuilt design, content, pages, posts, sliders and widgets that are carefully designed. Drag and drop page builder: Using powerful SiteOrigin as drag & drop page builder, you will struggle with no problem to build any page or content of your cafe & restaurant website. More than that, ThimPress develop SiteOrigin Widgets Bundle – a collection of all widgets, neatly bundled into a single plugin. It’s also a framework to code your own widgets on top of. What our customers say about this Restaurant theme? Great theme and powerful support. I am very happy, thanks! Hien has helped me greatly, with some issues I couldn’t figure out. Thanks for an amazing theme and support. You are very quick and accurate! Very creative. Simple and efficient back-end. Very fast page load, even with slider revolution running. Excellent work. Great built-in Restaurant Menu Manager plugin. 2 types of booking system: OpenTable by OpenTable Reservations widget or Reservation form by Contact form 7. Impress design with special arrangement. Amazing parallax effect to make a wonderful WordPress cafe theme. Styles has written by LESS CSS and compiled one time in WordPress Customizer to make this WordPress restaurant theme loads faster. Drag & Drop page builder Site Origin. Constantly update new features so that your website will never be out of date. The theme has detailed documentation and a knowledge base website to support users to create their best website as possible. Besides supporting all your queries on the Comment section, we also opened a Forum support so that we can discuss further customizations and errors relating to the theme. 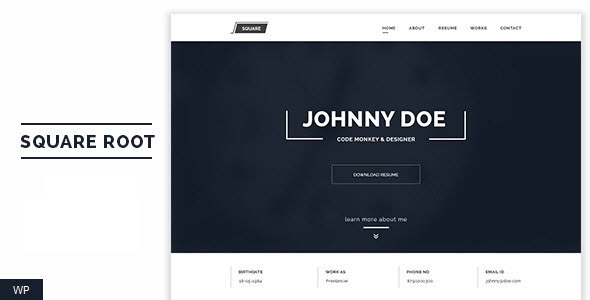 +Updated: Compatible with WooCommerce 3.x . +Fixed: Widget Thim Text Box for no image and responsive. + FIXED: Background image for menu on Firefox. + FIXED: Scroll on Chrome. + FIXED: Widget Menu Flipbook. + ADDED: Custom height widget Gallery. + FIXED: Widget Menu Restaurant not show post when install WPML. + UPDATED: Gallery not show when have more than one gallery in page. + ADDED: Menu List Update order by Name and Date. + ADDED: Our Team Page. + UPDATED: Tgmpa plugin to version 2.6.1. + UPDATED: Revolution Slider plugin to version 5.2.6. + FIXED: Google map widget. + ADDED: Filter event status in event archive page. + ADDED: Option for the event widget. + ADDED: Time format for widget Thim: OpenTable Reservations. + ADDED: Option Orderby for widget Events. + UPDATED: Menu Style 2 & 3 on PC. + FIXED: Make multi flipbook work on a page. + FIXED: Responsive on mobile. + Added: Option on/off overlay for Thim: Gallery. + Fixed: Crop thumbnail Archive page. + Updated: Option custom title for widget "Thim: Events"
+ Added: Option custom read more button for widget "Thim: Events"
+ Added: Option auto next slider for widget "Thim: Events"
+ Added: Option style pagination for widget "Thim: Menu FlipBook"
+ Updated: Option custom height for "Thim Flipbook". + Fixed: Option limit number item for "Thim Menu List". + Fixed: Change background color. + Updated: Option show/hide link menu item for widget "Thim: Menu Restaurant". + Updated: Option custom date format for widget "Thim: OpenTable Reservations". + Updated: Localization for datepicker, events. + New: option show/hide countdown box for Event. + New: Allow upload file SVG for logo. + Updated: Style for Menu in mobile device. + Updated: Style for Event archive page. + Updated: Customize new settings for Posts Page, Single & Archive. + Improved: page speed for this theme. + New: Home 2, Home 3 layouts. + New: 02 header styles. + New: Custom logo option for loading. + Updated: Remove products in mini cart with ajax. + Added: New option for widget Menu Restaurant. + Fixed: Widget "Thim: OpenTable Reservations". + Fixed: Bugs of  "Thim Event" plugin. + Added: Import demo data. Don’t even think about customising this theme in any way, this theme is meant to be used as it is, just text and image editing. Support is slow and very unclear, and their forum is impossible to figure out. I am a web developer and use loads of theme, I made a huge mistake buying this one. I am really dissapointed how easy and small tasks become so complicated and the ammount of waisted time. If you want a good advice, DO NOT USE this Theme. I reported quite a few bugs and issues and yes, they eventually fixed those, but the issues where of a ridiculous source, and shouldn’t be here on a online theme, this seems to be a wanaby theme that looks great but has loads of issues once you start adding your name on it all goes bunkers. I wish I never bougth this theme, my project ended up taking so many hours that I actually lost money. I am very mad! I should have known better, having over 20 years experience in the field, but with so many FAKE ratings, i was fooled. For all out there, don’t make the same mistake and NO NOT pay attention to the ammount of stars! Awesome support – very impressed with the response time of support. They were able to resolve my issue quickly. Theme is very well developed and easy to use. Good job! Awesome customer support and speed. I am supposed to have a support included in the purchace price. I just cannot find the bloody support. Your support website is having issues loads of error codes coming up. Support is great and very helpful, however I would strongly suggest developers to roll-out new versions of themes with updates and bug fixes as fast as possible. Many issues I’ve come across were simply bugs or lack of testing on different devices or with different fonts. Great theme, great customer support! customizability and customer support is crap… do not buy this theme!! !